This Extraordinary Chalet was conceived to provide an experience, unlike any other in North America. Whether you imagine a world-class ski experience, a spa vacation or a luxurious escape from the outside world, Casa Nova will respond to your needs. 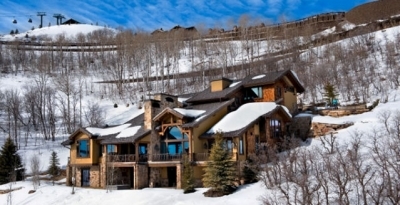 Located in the exclusive Deer Crest community, home to the St. Regis Deer Crest, this 13,000 square foot estate provides private ski-in/ski-out access to Deer Valley Resort, rated #1 Ski Resort in North America by the readers of Ski Magazine in 2007. The Chalet's seven bedrooms, including four magnificent master suites, afford extraordinary privacy in sumptuous surroundings, while our six separate living/loving/laughing rooms offer the opportunity to gather or to seek solitude. The Spa at provides state-of-the-art exercise, massage, steam and sauna facilities. When you stay at Casa Nova, you are not going to want for anything. Your entire stay will be reminiscent of the services at a world class resort and that's what makes us different. You can never have too much of a good thing as far as we're concerned. From the moment you arrive, you are given a transfer to the home, and the concierge and staff will be waiting for you. You will be helped with your luggage, shown the villa, and given an entire overview of the things to do in the area. Your local staff can also help you to find the right places to go for daytrips or night time events; they can get you tickets to a show or get you a skiing instructor at the house no matter what you want they can do it. Aside from having the best staff in Deer Valley, our Chalet boasts the following amenities: 13,000 square feet of living space, 7 bedrooms, 11 bathrooms, 4 master suites, 10 fireplaces, 10 terraces/patios, Skier's Lodge, On-Site Spa, Ultimate Kitchen, Screening room seats 15, Library, 2 hot tubs, State-of-the-art Fitness, Massage, Sauna & Steam Rooms, Oxygen bar, 13 custom-built ski lockers, Boot & glove warmers, 13 flat screen TVs, 4 bar areas, Baby grand player piano, Wood-burning pizza oven, 24-hour fresh coffee bar, Total Home Technology by Crestron, On-demand library of 345 DVDs, Outdoor kitchen, Wine cellar and Custom elevator.